Thirty years ago, end credits scenes were not as common as they are today. Still, the team behind The Lost Boys planned on doing one anyway. 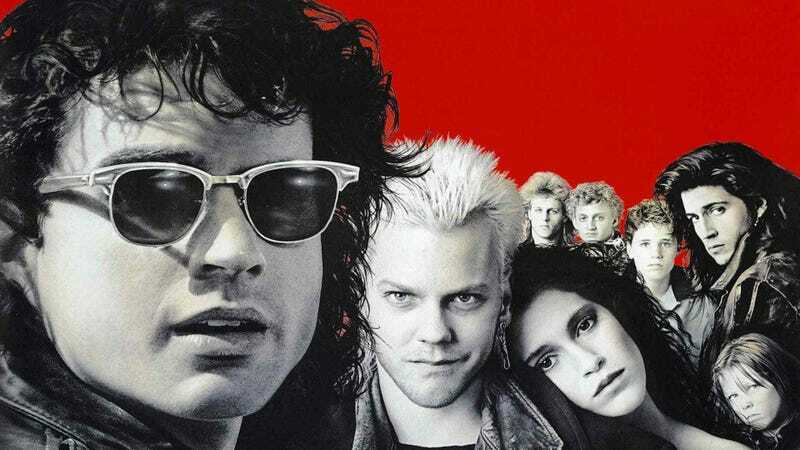 According to the new book Lost in the Shadows: The Story of The Lost Boys by Paul Davis, the original script from The Lost Boys had a different ending—an ending that was eventually moved to the end of the credits. After Grandpa’s triumphant return back home and the death of the head vampire, Max, the credits would have rolled and then the movie would’ve returned to the sunken, underground vampire lair. The camera would have floated through the space, eventually settling on an old mural. On the mural: Max in the early 1900s, with a huge smile on his face, talking to a group of young boys. Unfortunately, the scene was never shot nor was the mural ever created. According to the film’s production designer Bo Welch, because the film already had one great ending (Grandpa’s line: “One thing about living in Santa Carla I never could stomach... all the damn vampires”), the tag was never a priority. So when Warner Bros. cut the film’s budget by 35 percent before shooting, the scene was an easy one to get rid of. “It never got beyond the discussion stage,” Welch said. But it does still exist on the page. Davis’ book contains the script excerpt and has an illustrated interpretation of the scene by artist Gary Smart. Here’s how it read, according to the book. And HOLD TIGHT on one painting figure in particular. A man in a straw hat. He’s grinning broadly...and he’s most definitely Max. He’s talking to a group of young men. Were those young men supposed to be David and his crew? Was this a suggestion that Max could come back and do it all again? Or was it just confirmation that Michael and Sam had stopped a very old problem? Who knows. It’s a pretty vague scene, but an enticing one none the less. If you’re a Lost Boys fan, there are tons of awesome stories like that in Davis’ book. It was only published on a limited basis and is currently sold out, but you can find out more about it on Twitter or its official site.